Thou the Wiesel would never win any competitions as the most attractive modern armoured vehicle, it was a successful design for Porsche in the late 1980’s, which was manufactured by MaK and purchased by the German Army as a Lighted Armoured air portable weapons vehicle. 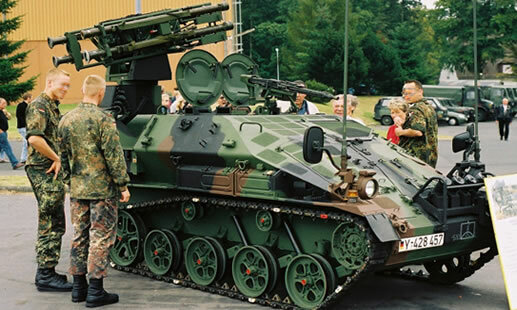 Mak, which is now part of Rheinmetall, had further developed the vehicle as a private venture. The new vehicle was an extended hull with the addition of a forth road wheel, with the 1st prototype completed in 1994. The German Wiesel 2 was selected by the German Army as a weapons carrier to mount the light air-defence system (LeFlaSys). 50 off these vehicles have been purchased, as has 10 platoon command posts and 7 battery command with deliveries starting back in 2001. The ATLAS launcher has a pod mounted on either side of the turret, with each pod holding 2 stinger fire and forget ground to air missiles. The platoon command vehicles are equipped with a roof mounted HARD radar system and the battery command vehicles contain extensive communications equipment. It’s a steel construction and its unknown what level of protection this offers. The vehicle normally has a roof mounted 7.62mm MG (depending on model) and a small bank of smoke grenade launchers mounted in between the head lights at the front of the hull. Crew numbers vary from 2 upwards. The 109hp Audi 4 cylinder diesel, which gives a top road speed of 70km/h, is located front left, driver to the right. The vehicle is fully air portable and carried on to the battlefield by the CH-53G helicopter.